Hernhutt, a ten acre country property, is the perfect spot for some rest and relaxation yet it's only a short drive to local beaches and the wineries on the 'Golden Mile' of Closson Road. It offers breath taking views of the countryside and plenty of outdoor space to enjoy the natural surroundings. In Europe, a 'hutt' refers to a quiet country retreat and Hernhutt will not disappoint if you're looking for a restful place to spend your holiday. 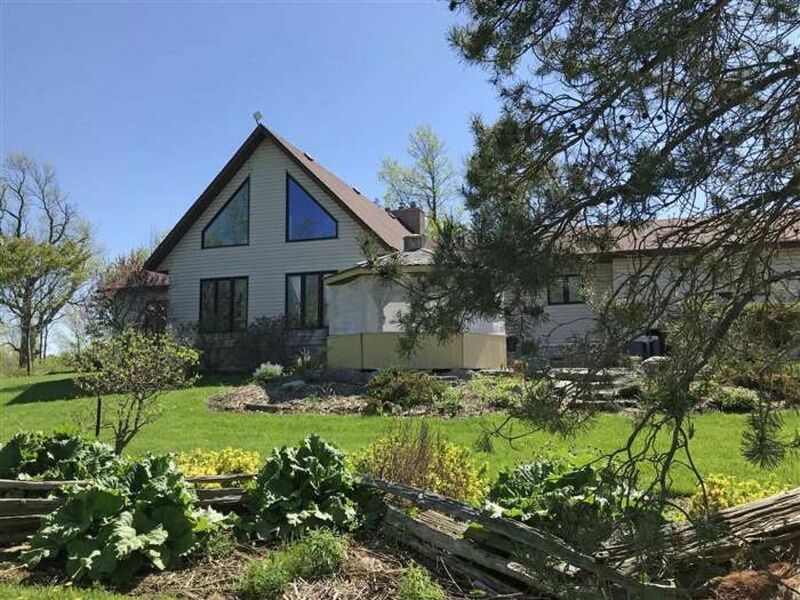 This three bedroom country haven is located in central Prince Edward County and is an ideal gathering spot for couples, families, and friends. The spacious great room features a vaulted ceiling, wood burning fireplace, a piano, and beautiful cherry wood floors. Overlooking the great room is a loft that provides additional gathering space, TV area and a cozy nook for reading. The modern country style kitchen is fully equipped and includes a large dining area. Guests will also be delighted to have an ensuite bathroom for each of the bedrooms. Outdoors, you'll find rolling lawns and gardens, a small deck, a patio, a gazebo for al fresco dining, walking trails and a 3 hole putting green. Within a short drive, you'll discover the villages of Bloomfield and Wellington where you'll find restaurants, shopping, public libraries, playgrounds, and live entertainment. The town of Picton is less than 20 minutes away and offers grocery stores and shopping for all the basic supplies you'll need for your vacation. While you're here, be sure to check out the many attractions of Prince Edward County. Spend a day of tasting and discovery among the many wineries and restaurants, relax at one of the local beaches or spas, shop and browse in the boutiques, artisan and antique shops, play a round of golf, explore the 800 km of shoreline surrounding this island community, hike the Sandbanks dunes, tour the County on bicycle, or check out the local farm markets and bakeries. CLEANING & LINENS ARE INCLUDED. Home is on a well therefore you're advised to bring drinking water.. Features Available: WiFi, TV/DVD, Netflix, central air conditioning, dishwasher, laundry. Features NOT Available: cable/satellite TV. High Season (Jun 30-Aug 31): WEEKLY RENTALS ONLY WITH SATURDAY CHECK-IN/CHECK-OUT. Low Season: 2 night min, 3 night min for long weekends. Accommodates 8 persons - max 6 adults; families & couples preferred. The house was perfect and met our needs .... big, comfortable, clean, bright and well equipped. The large well-maintained grounds provided us with peace and privacy. It was very nice to walk.